Hector Guimard, well known as a prolific French architect-designer, demonstrates a more refined style during Art Nouveau through his use of pearwood. It was of utmost importance to Guimard to emphasize the Gesamtkunstwerk of a project, to ensure the interior and exterior was a total work of art. Through his career he honed the slippery, fluid lines of Art Nouveau through a variety of material, although there is a definitive change after he constructs Hotel Guimard, his personal home. After discovering the fine qualities of pearwood, Guimard abandons the use of darker, denser wood previously used in works like Castel Beranger. 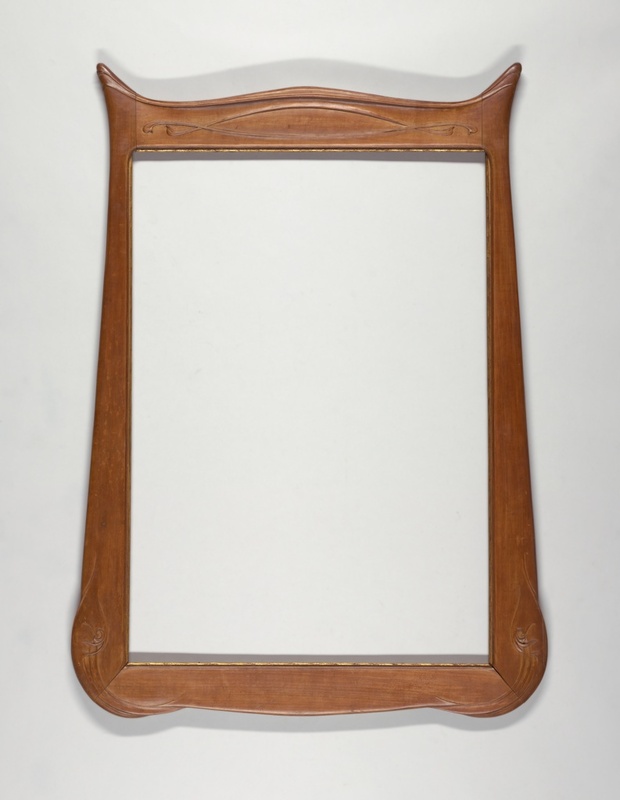 Pearwood plays well within the context of Art Nouveau as it is soft and supple yet strong material. Pearwood’s appearance is unified by nature, as it has many tight, small pores that makes the grain particularly uniform. This characteristic is perfect for a smooth, uninterrupted aesthetic that illustrates the constant undulating movement of Art Nouveau’s lines. The lightness of the wood’s coloration also connotes an aspect of weightlessness and flow. Guimard’s new interest allowed his expression of energy to dance more fancifully around his frames of all objects, and lighter colors appeared in other media, creating an even fuller definition of Gesamtkunstwerk. This and four of Guimard’s other frames can be seen in the new Thom Browne curated Selects, the thirteenth exhibition in the Nancy and Edwin Marks Collection Gallery series devoted to showcasing the museum’s collections. Thom Browne, fashion designer and 2012 National Design Award winner, is known for his focus on superior craftsmanship and a fresh re-examination of fashion with provocative ideas like uniformity as a means of expressing individuality. Browne’s immersive installation of holographic wallcovering, mirrors, and frames from the collection – some more than three hundred years old – invites visitors to reflect physically and mentally, while admiring what they see.